When Jack the Ripper, in 1890's London, steals H.G. Wells operational time machine, young H.G. pursues him through time, to 1979, San Francisco. This film could be compared to "The Time Machine". 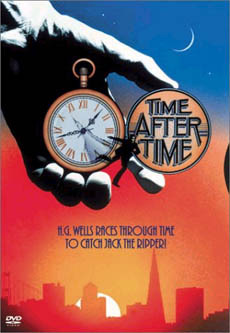 TIME AFTER TIME features romance, action, and great use of the San Francisco locations. Malcom McDowell and Mary Steenburgen have great chemistry, as the lovers from different times. David Warner is very spooky as Jack the Ripper. A highlight is McDowell's first trip to a fast food restaurant. The cast includes: Malcolm McDowell, David Warner, Mary Steenburgen, Joseph Maher, Patti D'Arbanville, and Charles Cioffi.